I bought this comforter set for my boyfriend for his birthday. He loves it, and it looks great in his room! The Abigail bedding collection creates a neutral feel to your space with a shades of blue. This set is made from 100-percent polyester dupioni creating a sheen to the navy, silver and blue grey colorways in this bed. The deep navy color creates a large border around the edge of the comforter and a silver border is used inside that to really give the blue grey a pop in the center. The decorative pillows make use of these same borders and colors for a completely matching set while the navy bedskirt adds some drama with its dark coloring. With these neutral colorways and large borders, this set will be easy to accessorize in any room in your home. Set includes one comforter, two matching shams, one bedskirt, three decorative pillows. This bedding set looks great in my master bedroom! 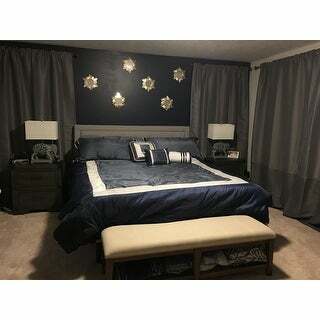 I painted an accent wall Navy that works great as the focal wall to the bed set. The colors in the set look great and my only con is that the outside of the comforter and shams with the lighter blue is a little scratchy and stiff but the inside layer is soft jersey. That helps so it is soft on the side that you sleep on. Really like good quality. The only negative is the sides are not long enough. I ordered this comforter set for my brother room he loves it loves the quality the color make the bedroom looks nicer . Love this color combination it’s soft comforter not too thick enough to have a good night sleep . Love the feel of this comforter set. It gives elegant look to a very large bedroom. The navy and white color combination is rich and throw pillows are just beautiful! Looks exactly as pictured. Quality of fabric and pillows are great. This bedding set is perfect for my lake house master bedroom. Theirs so many pieces for the great price, and with a cal king bed it all fits so well. Believe me you won’t be at all disappointed in this beautiful comforter bedding for any of your bedrooms. This look really nice on. Though the pillow material isnt great to lay on we have soft pillows with a soft shame so these are more decorative. Good size and quality made. I cannot say enough good things about this comforter set, it is exactly what I was searching for when I purchased it. The color is great with the contrasting trim and the throw pillows add to the overall look. A great buy for your bedroom. I received my comforter set for my California king bed and love it. It is comfortable and warm. Color not as pictured. Loose threads. Seems to be good quality. Colors are nice and nothing flashy but look classy. They fit good and colors look close to the online pictures. Would recommend this as a versatile set! Pretty bed set, except ours had some stitching of an off color. Also, seemed a little small, as it didn't completely cover mattress. Returns were easy, though. Beautiful, and comfortable!! Really love the fact that it is machine washable. With multiple animals in the house, it certainly comes in handy to just throw it in the machine instead of taking it to the cleaners. The product is easy to clean and looks lovely. I would definitely recommend it to a friend. "Is the contrast color white or silver?" It is a very light gray color. "What has been customer satisfaction with this set?"